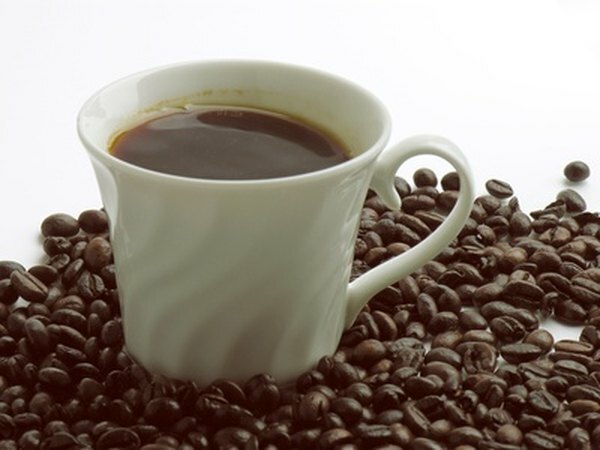 Caffeine is a bitter-tasting stimulant that is a natural component of certain beverages, including coffee and green tea. Caffeinated beverages can provide many health benefits as well as a burst of energy, but should only be used in moderation. According to Medline Plus, too much caffeine can cause irritability, anxiety and restlessness. To monitor caffeine intake, you should know the amounts found in green tea and coffee. On average, a cup of coffee contains about 115 mg of caffeine when prepared by the drip method, according to the International Coffee Organization. When ground coffee is prepared using a percolator, the amount of caffeine drops to an average of 80 mg. Instant coffees contain an average of 65 mg of caffeine. These amounts are based on a 5-oz. serving size. Although thought of as high in caffeine, a single shot of espresso, according to The Mayo Clinic contains only 40 to 75 mg of caffeine. According to the Mayo Clinic website, a 240 ml (8 oz.) serving of green tea contains 24 to 40 mg of caffeine. The way that you brew the green tea can affect caffeine amounts. The longer that you leave the tea leaves in the boiling water, the higher the caffeine amount will be. A cup of tea steeped for 5 minutes has nearly double the caffeine of a cup steeped for 2 minutes. There are decaffeinated versions of coffee and green tea. To be labeled as decaffeinated, the products must contain less than 0.1 percent caffeine per the U.S. Department of Agriculture's regulations. This means a cup of decaffeinated coffee can contain approximately 3 mg of caffeine. While caffeine has been shown to provide many health benefits from mental function to reducing the likelihood of cardiovascular problems and enhancing physical endurance, too much caffeine can negate these benefits. The Mayo Clinic recommends consuming no more than 500 mg of caffeine per day to avoid the negative effects of caffeine such as jitters and stomach upset. If you have a sensitivity to caffeine, avoid coffee and green tea. Doctors advise patients with gastroesophageal reflux disease (GERD) to eliminate coffee from their diet, as coffee may increase reflux and cause symptoms such as heartburn; green tea doesn't seem to have the same effects. Pregnant or nursing women are also typically advised by their doctors to avoid caffeinated beverages.